I’ve obviously documented my love for cupcakes here, here, and here however I also worship all forms of cheesecake. I think cheesecake is the perfect dessert to bring to a party or to serve at your next dinner shindig because I have yet to meet someone who doesn’t like cheesecake (and those that don’t like cheesecake have never actually tried cheesecake, trust me). We went to a BBQ held by one of the members of our Crossfit Box and I decided to go with my classic cheesecake recipe. This recipe originates from my cousin Aida (and I don’t know where she got it) but I’ve had to make a few adjustments to fit the Spanish supermarket (i.e. no graham crackers or sour cream). If you want a crack free cake then make sure to mix everything on the lowest speed of your stand mixer and to mix just until you reach the consistency you’re looking for or the ingredients are just incorporated. Cracks in your cheesecake originate from overcooking, too high heat, or air bubbles in the batter which can happen when you over mix. The cooking method of this cake is also helpful in avoiding cracks because it cooks at a low temperature for a long time. In the end the cracks don’t matter all that much cause you’re going to cover your cheesecake with fruit topping anyways but I just love the satisfaction I get with a smooth perfect cheesecake base. I didn’t get any pics of this cake sliced cause we took it to the BBQ and the setting wasn’t very photograph friendly but I can say that the cheesecake flew off the plate and nothing makes me happier than people enjoying my dessert. You definitely have to make this cheesecake and once you try it, it’ll be a go to in your baking repertoire. 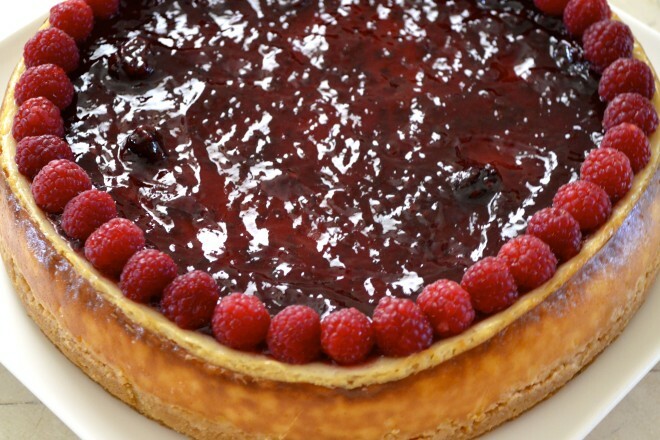 A delicious recipe for classic cheesecake. Preheat the oven to 220ºC/430ºF. Line the bottom of your 10 inch springform pan with parchment paper and spray with non-stick cooking spray and set aside. Add the cookie crumbs, sugar and melted butter to a food processor and pulse until combined. You can also just mix everything in a bowl until thoroughly combined. Press the cookie crumbs into the spring-form pan to form the cookie crust base and set aside. Add the cream cheese to the bowl of your stand mixer and use the paddle attachment. Beat on lowest speed until the cheese is creamy and lump-free. Add the condensed milk, sugar, and flour and mix until just incorporated on the lowest speed. Add all of your eggs and yolk to a bowl and beat and then add to the cheesecake mixture and mix until just incorporated. Add the vanilla paste and mix. Add the cheesecake mixture to the spring-form pan and bake for 15 minutes at 220ºC/430ºF. Lower the oven temperature to 110ºC/ 230ºF and bake for another 40 to 50 minutes until the centre is just set. 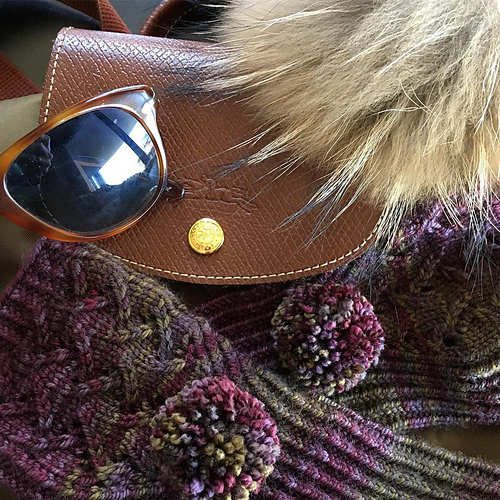 Mix all the ingredients in a bowl until smooth and set aside. Increase the oven temperature to 180°C/350ºF and spread the yogurt topping to cheesecake after the initial hour and 5 minute cooking time. Bake for an additional 8 to 15 minutes until the topping is set (I had to bake for 15 min. but start checking on it at 8 minutes). Turn off the oven and leave the oven door ajar and let the cheesecake sit in the oven for 1 hour. 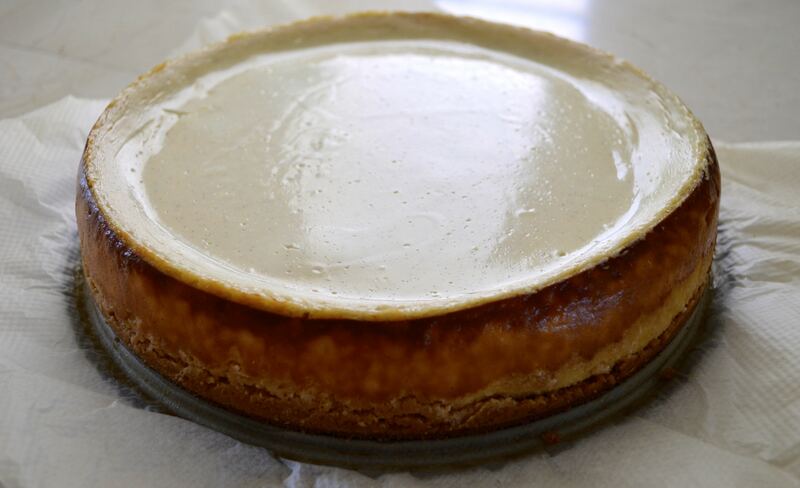 Remove cheesecake and let cool completely before refrigerating overnight. 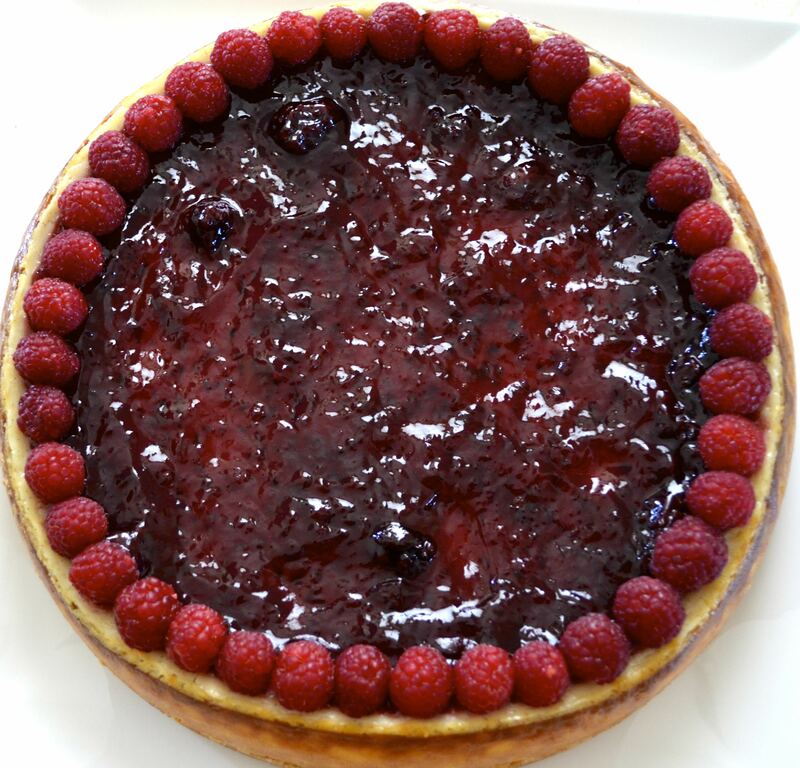 Spread the fruit jam and decorate the cheesecake with raspberries before serving. I suggest you either refrigerate the whole cake again or bring the whole cake to room temperature before serving. 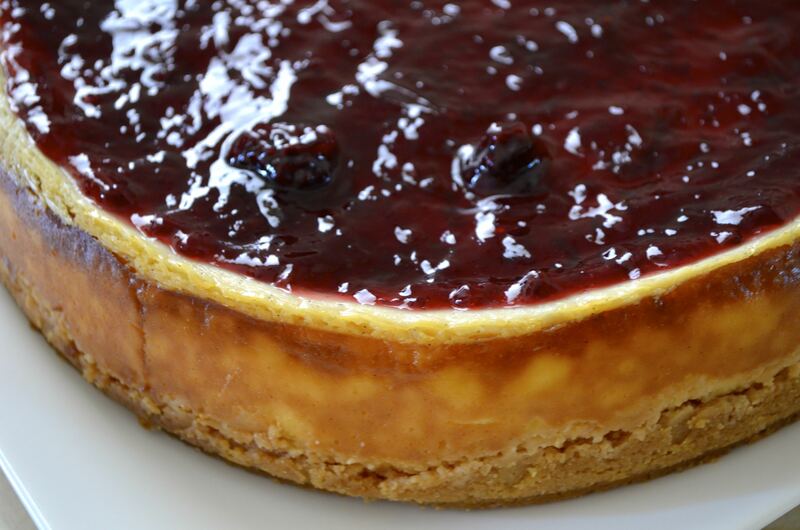 - The cooking time doesn't include the hour the cheesecake sits in the oven after it's been baked. - You should make this cheesecake the day before and refrigerate. Now go and cheesecake on!